For almost an entire year it was billed as this year’s version of “the game of the century.” With Matt Barkley deciding to return for his senior year, USC appeared to have the fast track to the Heisman Trophy and BCS national championship, the darlings of the off-season. Having defeated Oregon in Autzen Stadium last year, it was the Trojans earning all the hype and mountain of expectations for the 2012 season, despite Oregon’s three-peat Pac-10/12 titles. Then, USC lost. Then, USC lost again. The hype balloon deflated, the roles reversed, and Oregon is the undefeated team now considered the only legitimate contender for the national title out west; any shot of prestigious team or individual awards in the Trojans’ “BCS or Bust” pre-season mantra long since gone in the wake of Stanford and Arizona defeats. 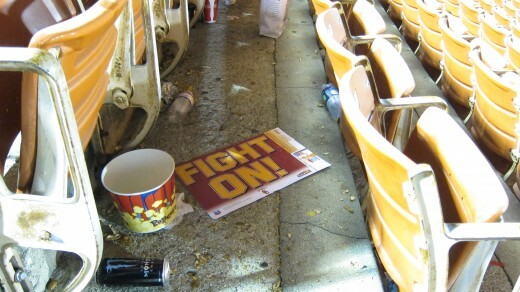 If the game Saturday pitting the Ducks and Trojans at the Coliseum had been reduced at all in national perspective after USC’s losses, the atmosphere Saturday certainly didn’t reflect it. For the teams playing and the fans in attendance at least, this was still the west coast’s game of the century; Oregon with BCS aspirations needing a quality opponent win to validate their BCS stature, USC trying to salvage their lost season with a big win against what has become their new biggest rival — the three-time conference champion Ducks. While back east the rematch of last year’s BCS National Championship game Alabama-LSU got the headlines, by the time the dust settled it would be the battle out west that proved the biggest statement in the ongoing fight for the coveted BCS finalist slots. With the offensive capabilities of both teams, it was easy to expect a high-scoring game…but not like this, even by fast-paced Oregon and Pac-12 standards. This was on a whole different level; this was unprecedented. 1,345 total yards of offense. With the nation watching, Oregon and USC put on a fireworks show normally reserved for arena football, where defense is intentionally optional. On this night it seemed, for much of it, defense was also nowhere to be found. It took barely a minute for Oregon to score with a five-play opening drive, capped off with a De’Anthony Thomas touchdown catch. USC responded with an impressive drive of their own, but as has happened so often this year, Oregon tightened in the redzone, forcing a field goal. A nine-play drive culminated in another score for the Ducks. This time it was Josh Huff finishing off a screen pass for 21 yards, the second of a four-touchdown performance by quarterback Marcus Mariota. The Ducks were off and running, but it appeared neither offense could be stopped on this night, which was quickly shaping up to be a classic Pacific Conference last-team-with-the-ball-wins kind of game. Oregon’s redzone defense shined again, with Ifo Ekpre-Olomu intercepting Matt Barkley in the endzone to preserve Oregon’s lead, 14-3. The Trojans may not have been lighting up the scoreboard (yet), but their ability to march down the field at-will was concerning, even with the Ducks being able to equal and exceed every blow the Trojans dished out. For the Ducks, it was the most impressive offensive performance of the year, quite a statement for a team known already for being borderline unstoppable. Despite USC’s best efforts, the firepower in Oregon’s arsenal was too powerful, the Ducks scoring with every possession, missing paydirt only on a missed field goal, fumble, and one lone punt late in the game. Mariota would throw for over 300 yards and add nearly 100 more on the ground to go with his four TD passes, but this amazing performance by the freshman signal-caller would be overshadowed by statistically the greatest night any Duck has had, ever. Senior running back Kenjon Barner had a night to remember and then some, one truly for the record books. A normally stout USC defense turned to butter against the quick-footed Barner, who racked up almost 170 yards rushing in the first half alone. With his late 4th quarter touchdown as Oregon bled out the clock, Barner had become the first Oregon Duck in history to eclipse 300 yards rushing in a single game, the Trojans looking a step slow and winded trying to keep up with Oregon’s frenetic pace and gashing runs. Add to the yardage five rushing touchdowns by Barner, neither feat having previously been accomplished by anyone against a USC defense, ever. But despite the gaudy statistics, the game was anything but the typical first half blowout Oregon fans have come to expect. 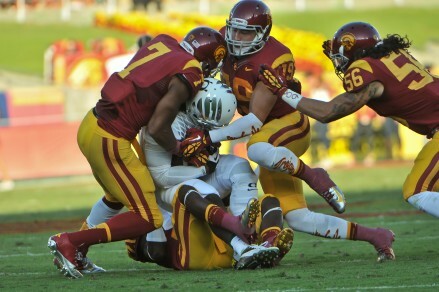 Oregon’s offense may have been borderline perfect, but so too was USC’s. Matt Barkley led the charge from a 21-3 deficit in the 2nd quarter, throwing deep to his world-class receivers, first hitting Marqise Lee on a 75-yard bomb, followed by a Robert Woods touchdown. Oregon’s offensive juggernaut performance aside, USC crept back into the game, aided by some poor penalties and bad tackling. At the half the Ducks held serve 34-24, but USC appeared ready to match the Ducks blow-for-blow. Receiving the ball first to start the 2nd half, an 11-play drive grinding out yards on the ground brought the Trojans to within three points, 34-31. Worse still, Oregon’s defense was not only getting run over, but hurt in the process. Four defensive linemen left the game and would not return, their status for next week’s road battle vs. Cal unknown. Isaac Remington, Dion Jordan, Ricky Heimuli and Wade Kelikiipi’s departures left big holes in the rotation up front, leading to USC being able to pound out yards between the tackles, and Barkley free to pick apart the Oregon secondary with little pass rush. Barkley would finish the day with 484 yards passing and 5 TDs, his favorite target once again being Marqise Lee, who finished with 12 catches and over 300 total yards–157 in the air and 157 more on returns. After the game multiple Oregon players and coaches held nothing back in their praise of Lee, calling him the best receiver in the nation. But it would not be enough. Oregon extended their lead back to 10 by the end of the 3rd quarter, 48-38. 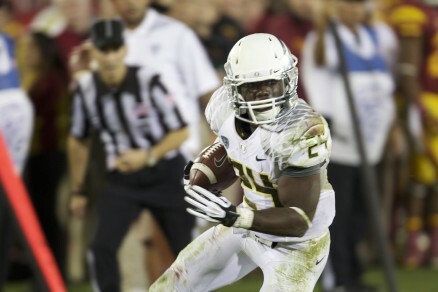 In the 4th quarter Kenjon Barner took over, bleeding the clock and putting away the game with two TD runs. USC failed to convert on a 4th down, and also missed recovering an onside kick by mere inches, not possessing the ball until the USC player was barely out of bounds. A late touchdown throw by Barkley with seconds remaining made the score more respectable, but not close enough. The Ducks had secured a hard fought 62-51 victory over the 17th ranked Trojans. Multiple records were set on the night. Barkley became the Pac-12’s all-time completions leader. Oregon meanwhile became the first team in NCAA history to score 30+ points in 23 straight games, and tied Texas for most consecutive 40+ point games in the BCS era at 12. The Ducks also put up more rushing yards, total yards, and points than had ever been accumulated against the Trojans in a single game. The loss leaves USC almost completely out of the Pac-12 South Division hunt, and left them pondering what the legacy of the Barkley/Kiffin era will be. Statistically, there has never been anyone better in USC’s illustrious history than Barkley, but for all the numbers the only thing they have to show for it is last year’s victory over Oregon at Autzen Stadium and an Emerald Bowl appearance, unacceptable for a traditional powerhouse such as USC. For Oregon, the race for the BCS championship remains as murky as before the game, with four undefeated teams jockeying for position, relying on human polls vs. computer formulas to validate one as being better than the other. Of course much of it could have been resolved had Kansas State not backed out of the game that was to be played at Autzen Stadium to open the year. For now, the lobbying between K-State, Notre Dame, and Oregon continues for another week with each trying to validate themselves as the primary challenger to Alabama. Regardless of what the computer formulas state when the new BCS standings are announced Sunday evening, Oregon’s victory over USC once again proved that when it comes to the eyeball test the Ducks pass with flying colors as vibrant as their uniforms. The previous argument was that Oregon hadn’t played anybody noteworthy yet. Now with a victory over mighty USC on their home turf in epic fashion, that blockade is out the window, and the Ducks are one step closer to a date with destiny in Miami. First though, after surpassing the Barkley hurdle, now it becomes time to win the day in Berkeley. 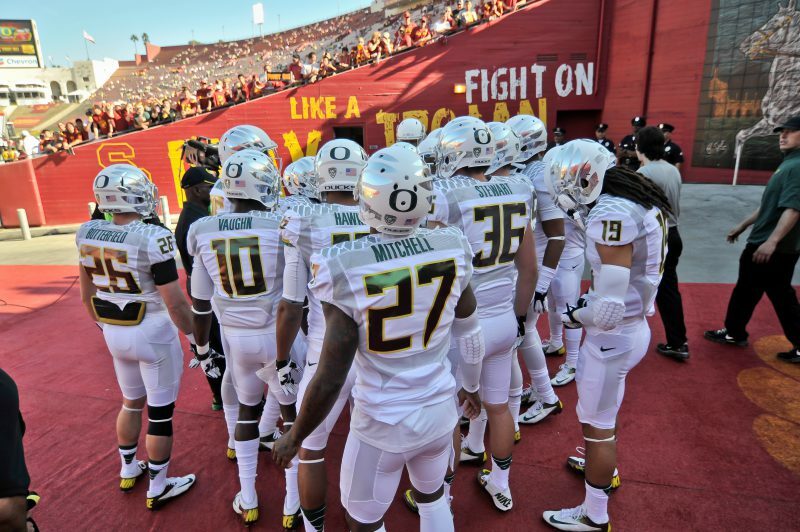 Anticipating “the game of the century,” the Oregon-USC matchup had been sold out since August. 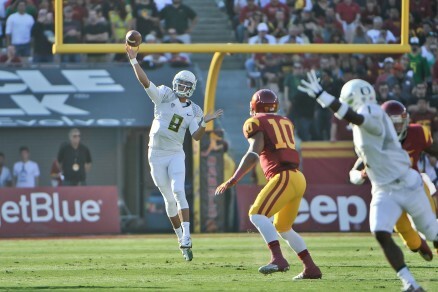 Oregon has rattled off 11 consecutive victories, since last losing to USC. Oregon is #1 in the country in scoring (54 ppg), adding to that total despite USC ranking in the top-25 in sacks, TFLs, scoring defense, and pass efficiency defense. 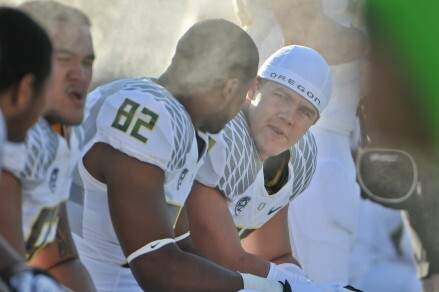 USC has only one player from Oregon (Troy Cardona). Oregon has 48 from California. On USC’s opening drive, Barkley broke the all-time Pac-12 completions record, passing Nick Foles, who set the mark last season. Oregon did not have a single 3rd down in their first two drives. USC’s blocked extra point in the 2nd quarter was the first missed extra point in Rob Beard’s career. The two teams accumulative racked up 864 yards of total offense…in the first half. By game’s end over 1,300 yards had been tallied. 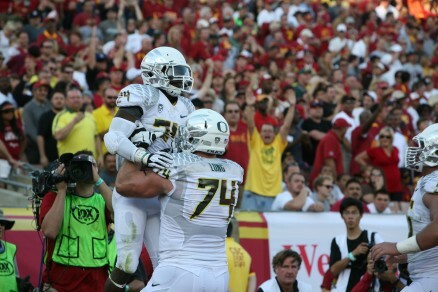 Oregon tied the BCS record for consecutive games with 40+ points at 12 with Texas. Oregon had the most yards vs. USC in history, breaking the old record of 623 by Notre Dame in 1946. Ducks also set a new record for most rushing yards vs. USC, most points scored vs. USC, and Barner became the first player to score five touchdowns vs. USC. Kenjon Barner became the first Oregon Ducks runningback in history to rush for over 300 yards in a game, breaking LaMichael James’ previous record of 288 yards (set vs. Arizona 2011). 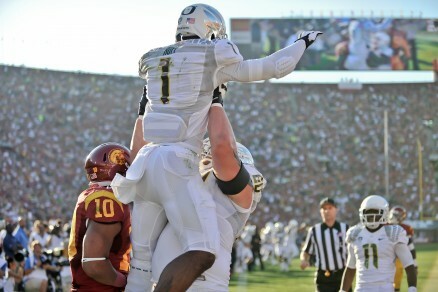 Oregon has now scored 114 points the last two times the Ducks have visited the Coliseum. Kenjon Barner is tied for first nationally in scoring at 13.3 points per game, and second in yards per game. This while only playing in the first half of most games.